Get ready for takeoff and some counting fun. This charming companion to Backseat A-B-See (2012) uses a counting concept to describe the phases of preparation for an airplane trip. A family of three with a boy wearing a yellow cap provides a narrative throughline for readers. “When taking a flight, what do you see? / 1 Airport / 2 Luggage carts / 3 Check-in desks” and so on, including escalators, trash cans and security officers. Following 10 gates are 100 fastened seat belts, 2,000 miles (3,200 kilometers), 33,000 feet (10,000 meters), a “million places to explore”—and “[o]ne happy meeting.” The digital illustrations depict the scenes with graphic shapes, universal signs and simplified white silhouettes similar to those seen on restroom signs for people; only the protagonist family and some key figures such as airline personnel are given any individuality at all. Humorous, graphically clever details abound. The trash cans are seen in cross section, filled with illegal items such as water bottles, scissors and baseball bats. Eight men and nine women line up across the spread from left to right waiting to get into their respective restrooms; the boy stands with his legs crossed. 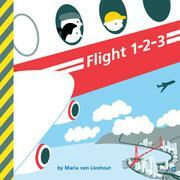 Informative as well as reassuring, this is ideal for prepping kids for their first flight (and maybe adults as well).